Rising Era Dynasty (RED) introduces a line of products that will completely shift the artificial and synthetic method of cultivating the soil and the crops. Their advocacies to enhance the farming has a long term solution to the known issues of unethical farming. Their products and services aims to address a known environmental issues that surrounds agriculture and livestock farming. 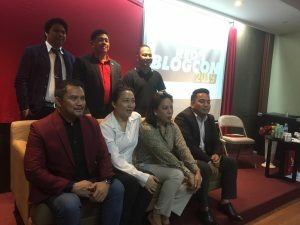 During the first blogcon for the year 2019, they presented organic and wellness solutions that every Filipino should be proud of. Aside from the line of products developed and manufactured in the Philippines, some products has been successfully tested to the dry land of Africa where they were able to grow crops naturally. RED in partnership with Kyzox Foundation also presented a long term solution to to protect mankind from life threatening illness brought by mosquitoes. An all natural product develop and initiated in the Philippines that would not harm other predators that kills mosquitoes. Dr. Martin Francois also pointed out that the commercial products made to kill mosquitoes are also the causing ecological imbalance as it also kills other life forms that eats mosquitoes. RED also presented line of products that promotes the wellness of animals, making sure that they’ll be away from toxins of antibiotics and other harmful chemicals that once induced may also affect the human that consumes its products. Their vision promote wellness not just in human, in animals, soil and environment promises a better environment for all of us. Imagine a food supplement for animals that promotes healthy immune systems, also promotes a healthy digestion resulting to odourless manure from the livestock farming as well as to house hold pets. They are innovators of well-being, addressing every phase of the cycle, from Soil to Plants, from Plants to Animals, from Plants and Animals to People, by getting to the heart of todays crisis in humans health: offering Organic Agricultural products as the essential first step. RED is a trailblazer, not only in their support for todays growing need of a nutritional revolution, but also in enabling this need to pave the way to Restore, Enhance and Defend a persons desire to Abundance and Prosperity. By creating a business platform with a campaign for well-being, every person has the opportunity to attain Financial Independence and Time Freedom. “RED is totally dedicated in providing and delivering outstanding quality products and services that will improve lives. Our vision is to be known as a top-of-mind brand for all our innovative and superb quality products. Expect our total commitment to exceptional standards of performance and productivity and we are willing to embrace new ideas and learn continuously to create a long term value for our consumers, our people and business partners, says RED President and CEO Jayant Red Era. Top selling wellness products of RED are the GoEssentials comprising of RED GoGreen, RED GoZyme, and RED GoDefend. To serve the rising clamor for beauty products, RED now has natural organic soap bars: RED Natural Organic Whitening Soap, RED Organic Sea Salt Soap, and RED Organic Algae Soap. And they also have the highly-preferred organic solution for soil and plants Grand Humus Plus and Grand Humivet for livestock. To beat the bite, REDs newest products is an anti-mosquito lotion to eventually beat the rising and fatal mosquito borne diseases such as Dengue, Zika Virus, Malaria and Chikungunya.